Easily clean even the smallest crevice! The Speed Master Vac N' Blo Jr. Hand-Held Vacuum makes cleaning your interior an absolute breeze! 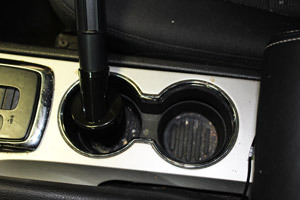 This hand-held machine can be used to either quickly vacuum away all the dust and dirt that collects on your seats and dash or expertly blow every speck of debris out of the niche crannies between the seat cushions. The Speed Master Vac N' Blo Jr. weighs less than 3 pounds, making it easy to deftly maneuver around your interior while you are cleaning! 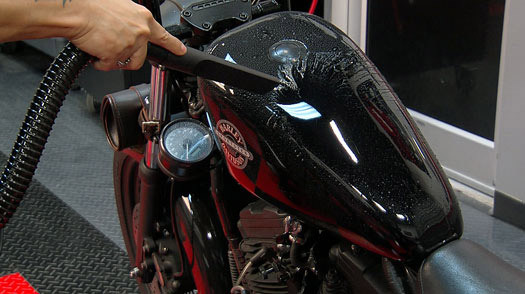 The Speed Master Vac N' Blo Jr. Hand-Held Vacuum also features a blowing technique that allows you to dry your motorcycle or car quickly after a wash! 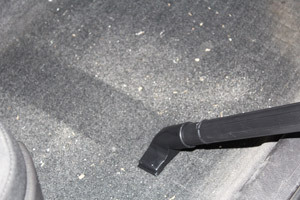 This also helps with blowing dirt, dust, and air out of small area on the interior before vacuuming! Nobody likes to spend money on purchasing a new tool simply to have to replace a year or two later due to wear and tear. To make sure that you are definitely able to get your fair share of use out of the Speed Master Vac N' Blo Jr., it was designed with extended durability in mind. The sturdy steel construction of the Speed Master Vac N' Blo Jr. means that you will likely have to replace the upholstery on your seats before you have to worry about replacing your Speed Master Vac N' Blo Jr. The amount of power that is packed into this small, light-weight machine is certainly surprising! The Speed Master Vac N' Blo Jr. boasts an impressive .75 horse power motor than gives you enough suction or blowing potential to tackle any mess you may run into with your interior. This motor allows the Speed Master Vac N' Blo Jr. to move air at an outstanding 70 cubic feet per minute! That is quite a lot of air for such a tiny appliance! The Speed Master Vac N' Blo Jr. Hand-Held Vacuum includes 6 different accessories, including a 20" extension wand for those hard-to reach areas, a upholstery tools for carpets, and a crevice tool! The various attachments and accessories that come with the Speed Master Vac N' Blo Jr. really allow you to hone all that power for any cleaning situation that you may come across. 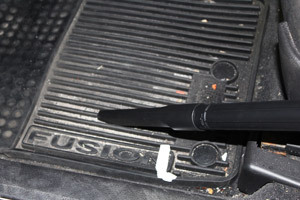 The Crevice Tool fits easily between seat cushions and even into the space between your seats and your center console. The Dust Brush helps to lift the fibers of your carpet and upholstery to release the ground-in dirt, promoting a better clean. With the Air Inflator Nozzle, you will be able to focus the air flow tremendously, so you can get intense blowing action into even the smallest nook! 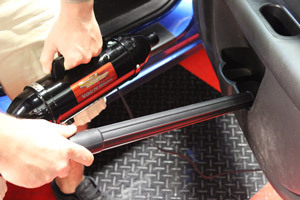 Whether you are detailing car professionally or just trying to make sure your own garage queen always looks its best, the Speed Master Vac N' Blo Jr. will give you all the power and potential you need to do so! Couldn't figure out a way to give 3.5 Stars. If (1) the strap you included could be attached to the machine better, or you came up with some other better design of easy use of the strap so that the machine remained in the user's desired position on either side of the body, AND (2) you provided a bag or a tote with some pockets or some other container to store all the tools in, I'd give it 5 stars easily. As for the Q would I recommend to a friend, probably would. But would express what I don't like about it as indicated in 1 & 2 above. Oh wait, one more thing, (3) in my 3 car garage the cord isn't long enough so I had to buy an extension cord (somewhat of a negative for me, but maybe not for many others). Prossuction power, being able to use it as a blower also, being provided extra filter bags and the tools, which are needed and work well.